There’s a beautiful synergy between my previous post The Angel’s Share and this piece on “The Devil’s Cut”, which I wish I could say was planned. In fact this partner piece came about as the result of a generous invitation* and lucky good timing, but don't all good things have an element of Devine intervention about them? 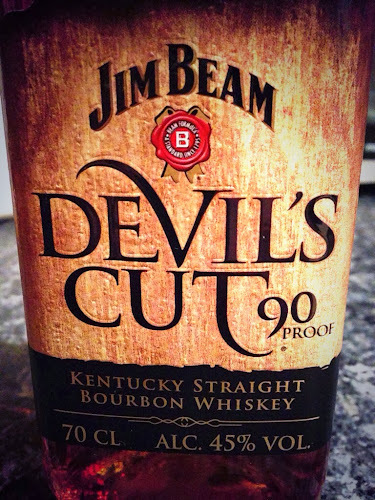 The Devil's Cut is a term coined by the Jim Beam distillery to describe the bourbon absorbed by the wooden casks during ageing - so as “The Angel’s Share” is the whiskey lost through evaporation, “The Devil’s Cut” is the whiskey lost to the wood. As anyone that has tasted a bourbon barrel-aged beer can attest, there is a lot of woody, vanilla rich bourbon character left behind once the whiskey itself is removed from the cask, and it’s this trapped spirit that Jim Beam have utilised to great effect in their new whiskey of the same name. The bottled “Devil’s Cut” Bourbon from Jim Beam is a combination of a 6 year aged bourbon and the intensely flavoured spirit extracted from the wood of the emptied barrels – a novel idea that you could pass off as a marketing gimmick if the end product wasn’t such a vast improvement on their standard offering. Jim Beam white is the best selling bourbon in the world (Jack Daniels is a Tennessee Whiskey - not a Bourbon) so they must be doing something right, but it is a bit of an inelegant beast, something usually enjoyed with coke and not the kind of whiskey you'd ponder over. The Devil’s Cut on the other hand really is a bourbon I could see myself sipping rather than supping, with a spicy oak sweetness and lingering, sweetly charred finish that puts some much more expensive bourbons to shame. It’s actually a much stronger whiskey too at 45% abv compared to the standard white label which weighs in at 40% - but that extra strength doesn’t come with extra heat and the long maturation ensures the Devil’s Cut is actually a much smoother sipper than the standard bourbon, but with lots of added complexity in the aroma and flavour. Let’s not get ahead of ourselves. Jim Beam's The Devil’s Cut is not a nuanced world class bourbon, like the excellent George T Stagg by Buffalo Trace, and it doesn’t have the wow factor of other American whiskies like Highwest Double Rye - but in terms of sheer bang-for-your-buck quality? It’s one of the best I’ve tried. If you’re looking for an affordable bourbon with lots of oak flavour, perhaps to use as the basis of a great old fashioned or to sip neat, then this is well worth a punt. Next post... Beer. I promise. *I was invited to try the a range of Jim Beam bourbon products (including their honey and cherry flavoured varieties which are not to my tastes at all) as part of a huge PR event currently going on at the Old Truman Brewery on Brick lane (more info here: http://www.eventbrite.co.uk/e/jim-beam-stillhouse-tickets-3737446804 - be quick if you'd like to attend tonight, it's the last night). I didn’t know what to expect but getting to hear the story of the Jim Beam Distillery from the man’s own great-great-great Grandson was pretty special, and made the whole thing worthwhile. That said, the Devil’s Cut was the only part of the ‘Jim Beam Experience’ that I thought was worth writing about,despite it being on the whole extremely interesting. It is genuinely an excellent bourbon, you should give it a try.